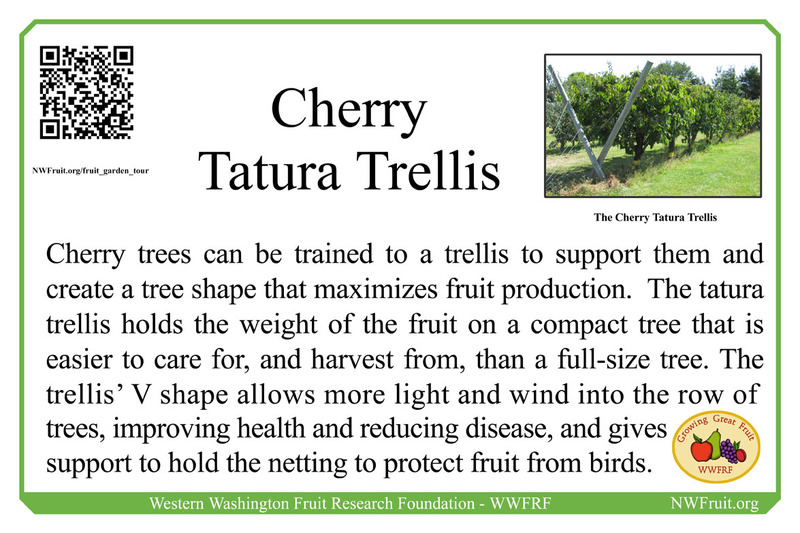 Since the Tatura trellis systems are not compatible with vigorous rootstocks that require excessive pruning to constrain tree size, The cherry varieties on the Tatura trellis in the WWFRF Fruit Garden are grafted onto Gisela 5 rootstocks. The whips were planted at a 4-foot spacing along the trellis. Five wires were positioned on each side of the support poles, which are set at a 60˚ angle. The first wire is 2 feet from the ground, and each wire is set 1-foot apart, with the top wire at 7 feet. As the trees grow, two scaffold branches are trained onto the bottom wires, one on each side of the V-trellis. 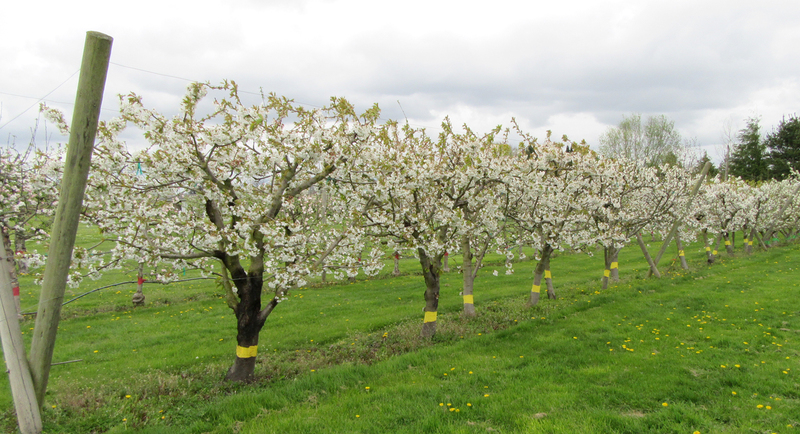 Minimal pruning during the first three years, combined with bending and tying, will induce earlier fruiting and reduce tree vigor. Once the trees are fruiting, excess laterals and growth can be removed. This trellis is oriented East-West, but trellis systems should normally be oriented North-South. Trellised cherries are made possible by dwarfing rootstocks such as Gisela 5. Gisela rootstocks produce dwarf trees that are 40-70% smaller than standard trees, bear 3-4 years earlier, are adaptable to a wide range of soil types, boast wide-angles and flat branching (easier and more flexible to support and train), and can produce 40 pounds of cherries in their first years. Gisela 5 reduces tree size by 45%, resulting in trees that can be kept at 6-10 feet tall. To balance the early and heavy fruiting of these rootstocks, 60-70% of the tree canopy should be removed in August each year, starting in the fourth year. The Tatura trellis was developed in the 1970’s at the Tatura Research Station, near Shepparton, in Victoria, Australia to assist in the mechanical harvesting of fruit, especially canning peaches. Another goal was to allow mechanical pruning, using a hedging machine. In the years since, other advantages and disadvantages of the system have been realized. Trees trained to the Tatura trellis are easy to net for birds or cover with plastic or shade-cloth to protect fruit from the weather. Good light penetration enhances fruit ripening and flavor. Increased air flow through the tree reduces disease. Smaller trees reduce harvest and chemical costs. The 60 degree post angle is perfect for training and maximizing fruit production. Overall, the Tatura trellis is one of the most productive training system in the world.